Hi - I found this review in google - we appreciate the comments, especially from a "lager country", though I know you like your ales as well. We have worked hard to not have contaminated beers. It is a question of good cleaning and sanitation practices. This is a common problem, typical of many brewery start-ups. Most breweries (and microbreweries) in the USA and Europe have already gone through this phase long ago, so this is not so common in those more established markets. However, in Latin America most breweries are start-ups! And many beginning "brewers" are homebrewers who expanded, but continued using homebrew cleaning and minimal sanitation, not adapting good brewing practices. Darwin prevails in the end, either you evolve and learn to do it right, or you perish. Hopefully brewers in Latin America will advance to the point that beer drinkers will no longer be surprised to find a beer that isn't contaminated. We brew 7 beers plus a couple of specialties. In Chile we distribute nationally via Concha y Toro and have done our first export to Vindanmark in Denmark (Rubia al Vapor, Negra Stout, Strong Ale) so hopefully you will soon have some SZOT stock closer to you in Sweden. Regarding the flavor components of our Pilser, I agree with you. Refreshing, but with some Ale type characteristics. This has to be the yeast (Mauribrew lager from Australia in dry form). We fermented for 4-5 weeks at 10 degrees C and then lagered at 6 degrees C for about 10 days before bottling. We only used 1% caramel malt (99% pale pilsner malt) so I can't explain the slight sweetness, but it's there. Anyway, I didn't want to do a "traditional" pilsner - the hops are Sterling, a Saaz derivative. We have also done this beer with a 5% quinoa base, very nice, but this version is 100% barley malt. Vindanmark also liked our Pilsner, but told us that Denmark is already saturated with pilsners, so would be difficult to bring in a Chilean version. I think we should also play with the label a little for export. Once again, thanks for the comments, and if you ever try our other beers, we appreciate the feedback! I already tried the Szot Strong Ale it was probably the best beer i sampled in Chile. If i see your products around here, be sure i'll give them another go. 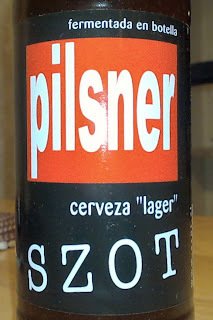 We are now selling SZOT Beer..
Hopefully it will reach Sweden in the near future.